December has been a good month for cultural benchmarks. 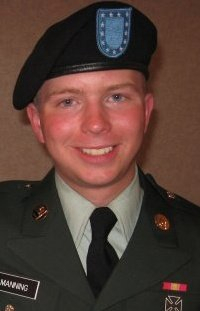 First, we have the case of Private First Class Bradley Manning (shown above) who is accused of misusing classified information. Our military thinks that PFC Manning is the source of classified documents provided to WikiLeaks spokesman Julian Assange, and that he should be punished under the Uniform Code of Military Justice (UCMJ). Second, we have the case of Ward Churchill who is litigating to regain his position as a professor at the University of Colorado. Professor Churchill is accused of misconduct in teaching and research, and has lost a recent appeal. Then there is the case of Congressman Charlie Rangel. He was recently censured by the U. S. House of Representatives for ethics violations. And, finally, there is the case of Helen Thomas. She was recently forced into retirement after making anti-Semitic statements. Opinion Journal Editor James Taranto has an update. But even this is complicated. Ms. Thomas is a longstanding professional journalist, and she has the sophistication to keep her private beliefs from tainting her work. Is it possible this is all an overreaction? I suppose all of the people defending the actions of these four individuals have a point. Controversial actions do need to be assessed with deliberation and a sense of balance. The Week has a rundown on reaction to the video, but it fails to delve into the cultural aspects. Here’s what I’m seeing: Listed above are four actions that receive the “benefit of doubt” treatment. The actions may be deplorable in some fashion, but they get a fair discussion in our culture. Contrast that with the treatment of Sarah Palin in the Gwar video. There is no specific action that is being adjudicated. Simply because she is a Republican, it is fair game to disembowel her. It’s not complicated. It’s not even controversial. It’s just a reflection of our culture. In an 8-0 vote (with one abstention) The Berkeley City Council has tabled its Bradley Manning resolution for an indefinite period. The council apparently needs more time to determine if PFC Manning is "a hero or traitor." The council members might be coming to the conclusion that "it's complicated." CNN reports that Bradley Manning has been sentenced to 35 years in detention and is changing her name to Chelsea. More than likely she will serve no more than seven years at Fort Leavenworth.